I have a bit of a love-hate relationship with oven gloves. I always go for the pretty ones but the minute I lift the dishes from the oven they get black marks and food stains all over them. Of course this means that I need to wash them pretty frequently and the colours start to fade quickly. Proud & Co Kitchenware kindly sent me some of their new designs to test, after all I do seem to spend most of my time in the kitchen these days. I love a good design but what I love even more is an innovative design that offers you something that you don't already have. 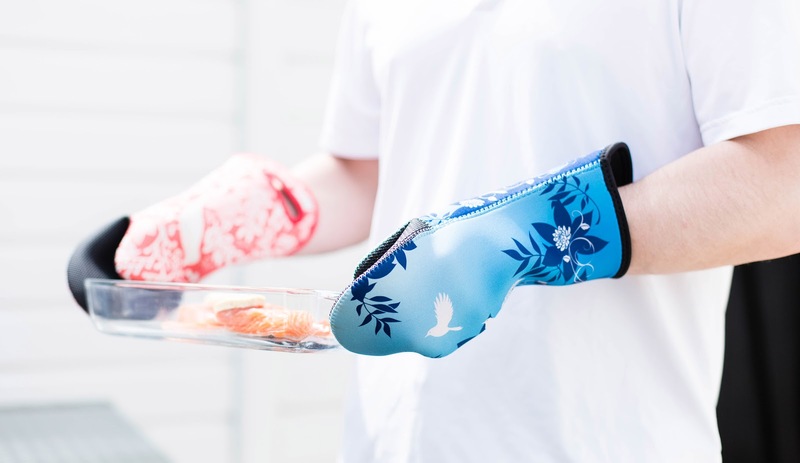 We seem to spend so much time in the garden these days, mainly dining and barbequing, that these pretty oven gloves couldn't have arrived at a better time! Proud & Co are a high quality kitchenware brand dedicated to providing innovation and elegance in everything they create . 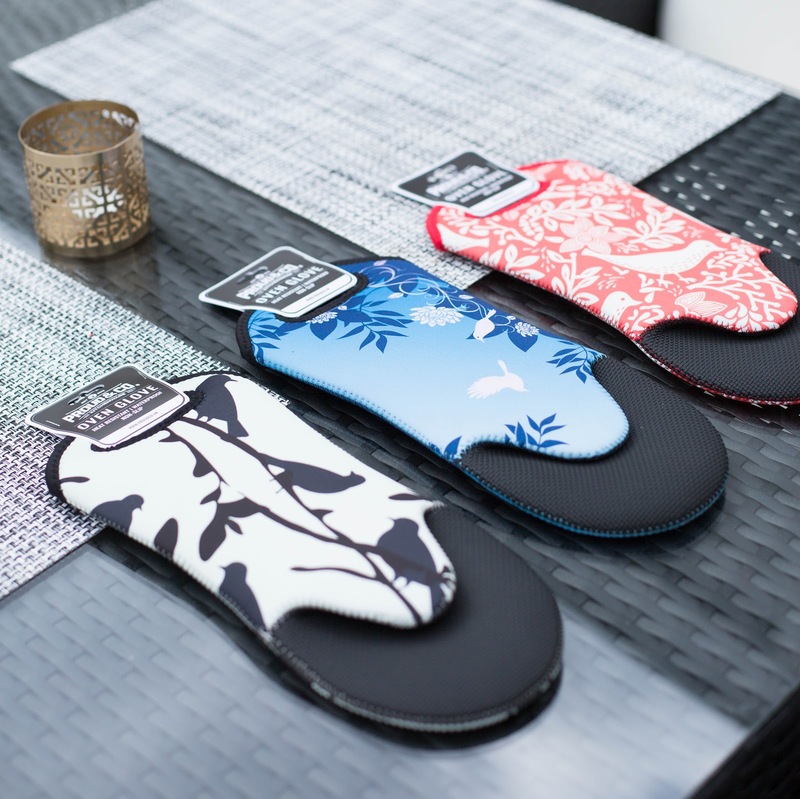 Their Silhouette Oven Gloves are heat resistant and dishwasher safe as well as incredibly stylish. It almost sounds a little too good to be true doesn't it. The thing is my old oven gloves are not very heat resistant at all. They are 100% cotton and I need to put the dishes down pretty quickly or I will burn my hands. That's why I am used to placing the dishes on the kitchen counter within seconds they come out of the oven but wouldn't it be great if I didn't have to? 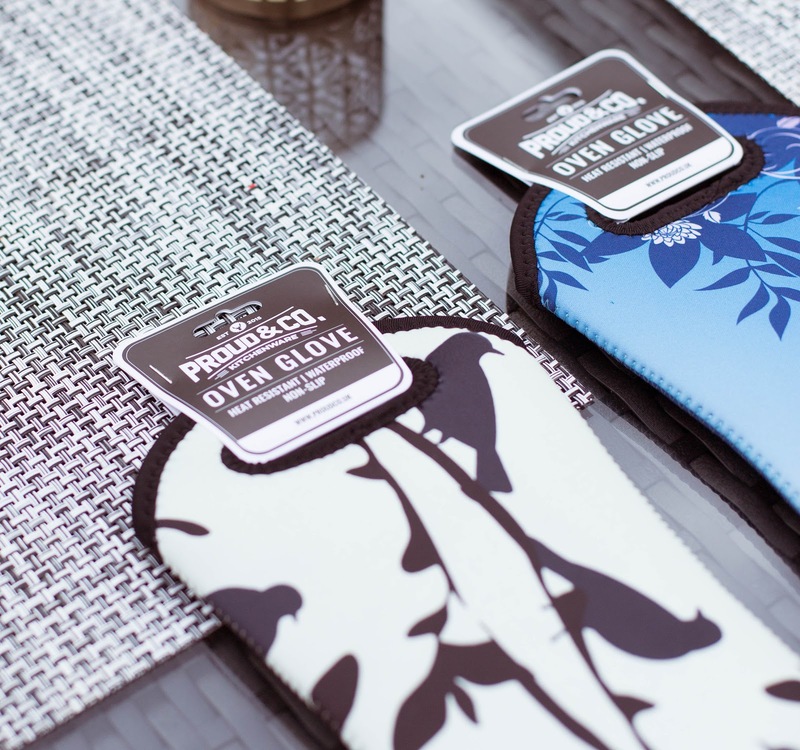 These oven gloves are definitely stylish and elegant. 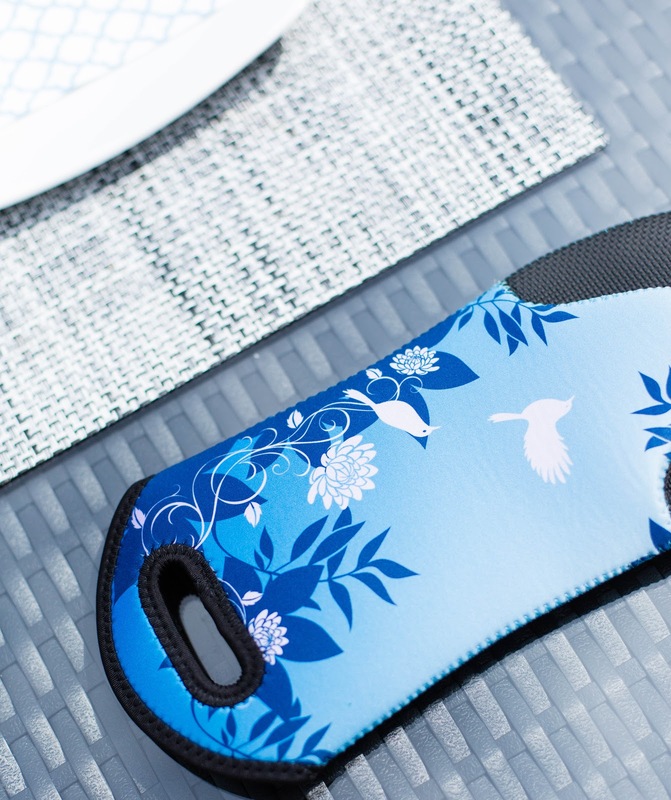 The beautiful pattern really differentiates them from any other rubber oven gloves that I have seen. The stitching is perfect and I honestly can't fault them. They look well made and well designed. Proud & Co have recently added two new designs and colours (red and blue) to their collection and I must say that the new designs impress me even more. Don't get me wrong, I love the black and white pattern, but the red and the blue are very much on trend at the moment. If I had to pick my favourite, I'd have to choose the blue oven gloves. It's such a beautiful design and I just think they are perfect for the upcoming summer season. They also happen to match my existing tableware which is very handy. I'm loving blue at the moment in case you haven't noticed. Blue accessories feel so summery and remind me of the sea side. 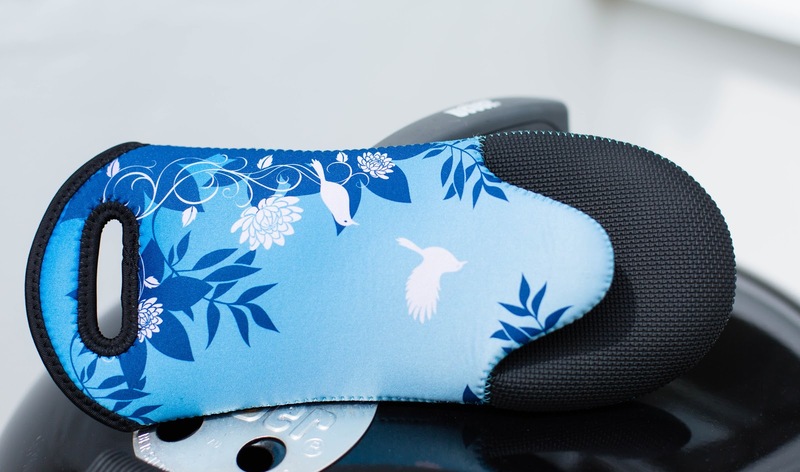 There is no denying that these oven gloves are easy on the eye but I was positively surprised how comfortable they actually are. The grip is excellent and finally we have oven gloves that don't fall off. We have been using Masterclass oven gloves in the past but they are too big, even my husband agrees, and keep falling off. 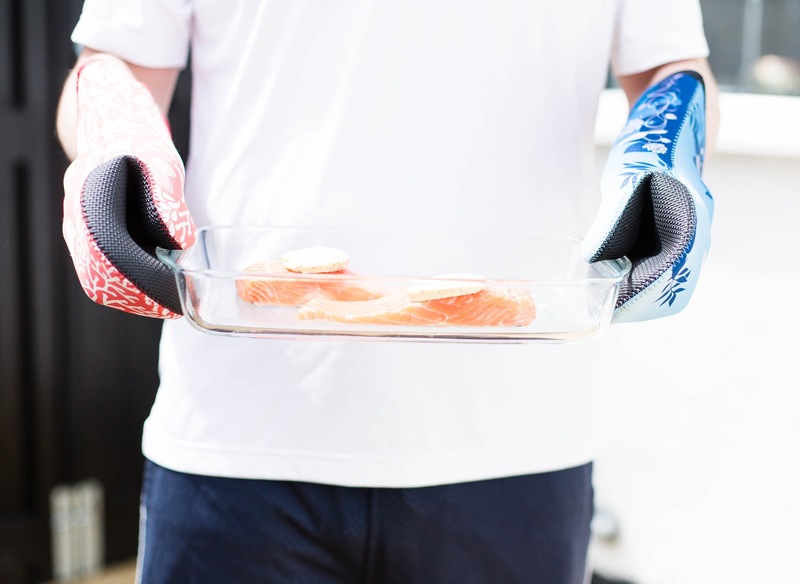 The Proud & Co oven gloves on the other hand feel immediately comfortable and I can get a good hold of just about anything. The material seems also very heat resistant. I have not burned my hands once and I've actually waited to see how long it takes before I can feel the heat through the rubber part. After 10 seconds the oven gloves feel warm but they still don't feel too hot. The rubber on the side of the palm makes sure that you don't drop the dishes which is great especially when handling smaller items. However, you are not supposed to apply direct heat on the rubber part. My husband used them when we were barbequing and touched a hot metal food holder (literally straight from the grill) and it left marks on the side of the palm. Barbeque/grill tends to be a lot hotter than a normal oven so that's why I think we will mainly use these in the kitchen/with the oven. 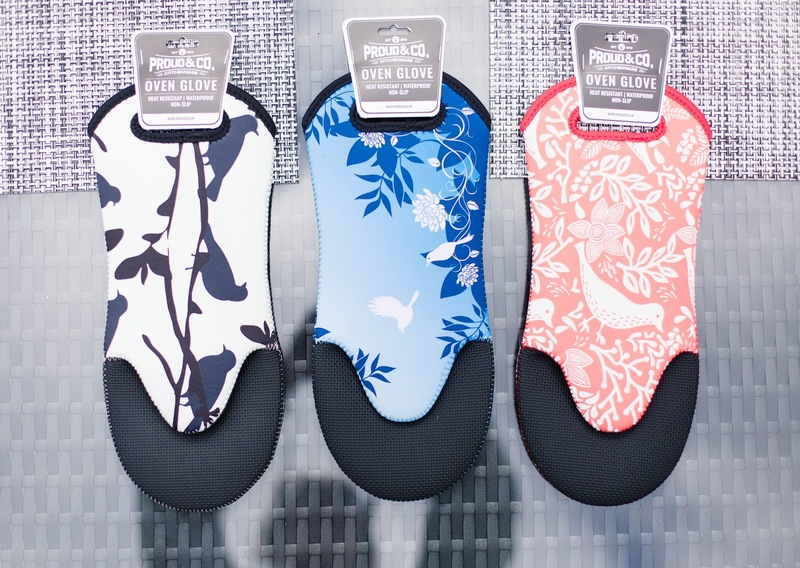 These oven gloves are also easy to wipe clean although they don't gather dirt that easily. I've washed them in both dishwasher and washing machine and they look brand new afterwards. I don't actually think you need to wash them that often but I still wanted to see how they hold up. I have to say that even though I was a little sceptical first, I am impressed and so is my husband. There is no doubt that these are the best oven gloves we've had in this household but I've only used them for a few weeks so I cannot say how the material will hold up in the long run (although it's looking pretty good so far). I love that they are so pretty that you can even leave them on the dinner table and they will not look out of place. In fact, I think they will be quite a conversation starter especially amongst the ladies. I actually wish they had more accessories to match the beautiful pattern. Imagine a matching apron and a tea towel. How beautiful would they look together, right? It would also make sense to sell these oven gloves as a set of 2 rather than individually. 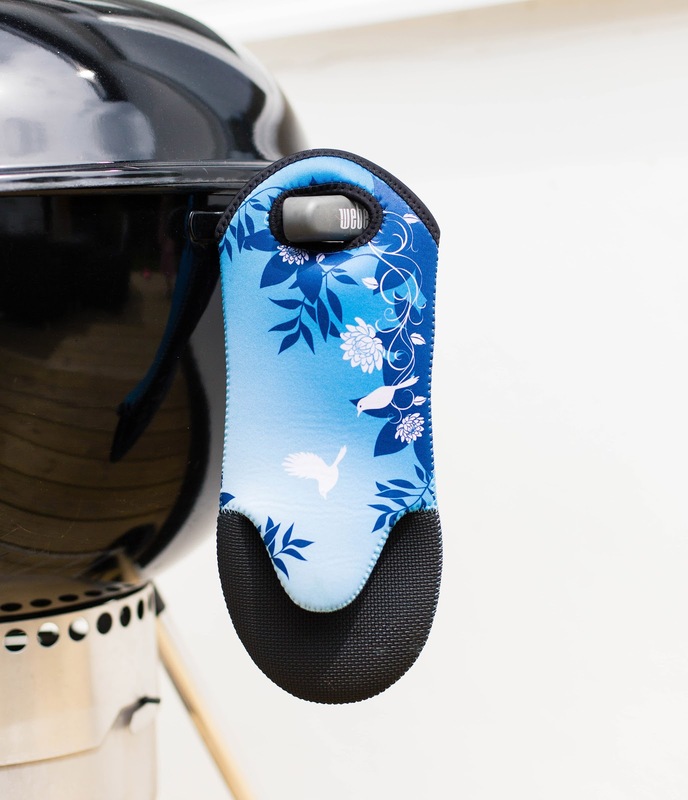 I think most people will want two oven gloves and even though you can of course purchase two, it would just be a bit more convenient from a customer point of view. So if you're looking for new oven gloves for yourself or as a present I can sincerely recommend these. Proud & Co are pretty sure that you'll be just as impressed which is why they offer a 30 day money back guarantee if you're not happy with your purchase. 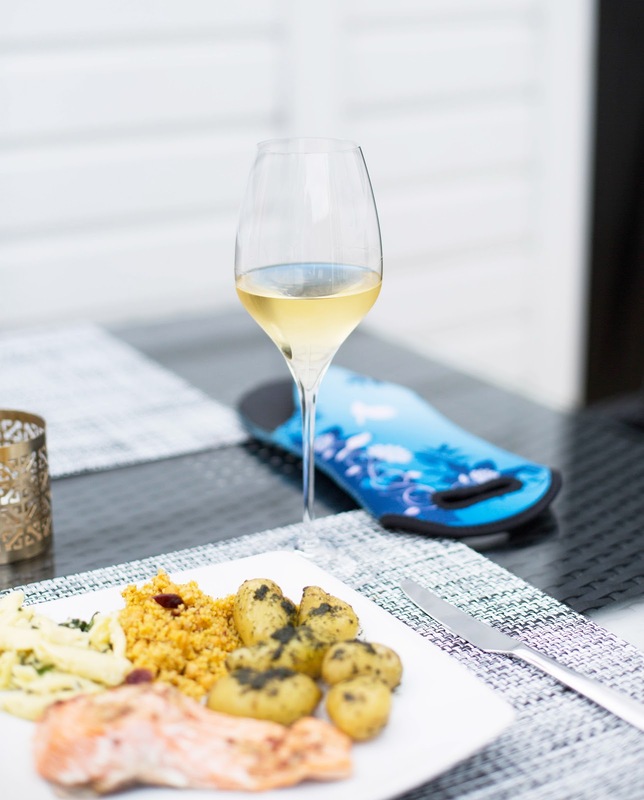 * This blog post was in partnership with Proud & Co Kitchenware.